No reason was given for Blount's removal from the tour, only that the post “did not meet community standards,” Blount said. And what side are the fascist's? So, if you vote wrong, you don't have talent after all? Kenny has been trolling FaceBorg trying to get a ban lately, take a look at http://knuckledraggin.com/2018/11/trolling-facebook/ for the story. Too many pics to post... Probably NSFW, it IS Kenny after all. This boycott is going to hurt. Most don't. This one will. Gads. People need to get a life. Is Facebook that important? The modern "opiate of the masses" and Skynet all tumbled into one package. in 1999 i was working backstage doing the dressing room catering for zztop and lynyrd skynyrd .anyway billy gibbons got mad at me because his very hot road girlfriend walked up to me and asked me where she could smoke (.tall red head blues eyes ).i tell her .baby as smoking as you are anywhere you want is fine with me and her being the texas sweetie that she was just had to give me a hug and a kiss for that compliment . billy is not that tall and is a bit skinny . Now that our homes are full of smart speakers, there seems to be a new focus on getting us to adopt smart displays as well. Amazon has been pushing them for a while in the form of the Echo Show , which is now in its second generation. Google also entered the fray with the Home Hub, and now Facebook is entering the market with Portal. Launched last month for pre-order, the Portal comes in two forms sporting a 10.1-inch, 1,280-by-800 display, or a 15.6-inch, 1,920-by-1,080 display as the Portal+. The main reason for owning a Portal device is to use it for video calls through Messenger. It uses a smart camera to follow you around the room and automatically minimizes background sound to improve the quality of your chat. At the same time, Facebook embraced Amazon and included support for Alexa. So the Portal and Portal+ can act as a replacement for an Echo device , too. As this is Facebook, privacy is a concern and Zuckerberg is well aware of that. To boost confidence and promote privacy, the social network ships both versions of the Portal with a camera cover, the ability to disable the camera and the microphone with a single tap, and a four- to 12-digit passcode for security. Both versions of the Portal start shipping today and discounts are available depending on how many you purchase. The Portal costs $199 where as the larger Portal+ is $349. If you buy one of each Facebook knocks $100 off the total. Purchase two of the smaller Portal devices and the price drops to $298. I suspect zz is a liberal Democrat. Even if Gibbons isnt a Democrat or liberal its suicide to allow Democrats and liberals control what you do. Best thing to piss off a liberal Democrat is to ignore them and continue your path in life. Anybody remember one of my favorite old obscure but eerily prophetic TV shows - Max Headroom? So was it the tour manager that removed him or was it Billy Gibbons? Article is pretty short on the details in that regard. I really hope it wasn’t Billy, I’m a big fan of his. I'm not even 40 and I remember. Matt Frewer was good stuff then and still is. 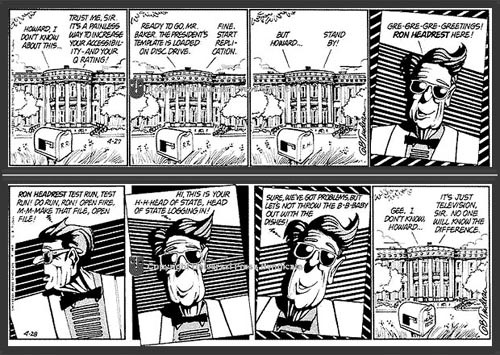 But do you remember the Doonesbury equivalent? R-r-r-r-ron Huh-huh-Headrest. I saw that concert in Va. Good show. I wonder if all this happened because they're liberal, or because they wanted to head off the Antifa thugs protesting and beating attendees at the remaining shows? Oh wow. It’s 1984 manifesting into actual reality. Scary! The crazy thing is, many people will probably think this is cool. Especially if it ever includes Snapchat and Twitter, which will entice the younger, cooler, “anti-Facebook” millennials. Yeah, it's getting crazier! Those gadgets scare me to death... the implications of what they COULD be watching/listening to are sobering. How any sane person (without extenuating circumstances... I could see someone who was housebound, etc finding the usefulness outweighing the potential Big Brother drawbacks) could actually have one of them hooked up in their house baffles me. Worse is it's unnecessary. If you wanted to video chat--and I can see that for people who live across the country--you don't need a device that follows you around. A laptop will do the job nicely. Many tablets and smartphones will too, and you can just pick them up and carry them around. Plus, if you're that concerned about eavesdropping, just line a box with tinfoil and drop your device therein when not in use. I may be incorrect, but, isn't this exactly what the new 5G technology is all about? Connecting all devices wirelessly? Properly applied, these devices have some potential for providing benefit. For example.... I have an old Kohler toilet upstairs that is known to occasionally have problems removing all of its contents with one flush. Installation of this type equipment would probably allow me to ensure the toilet flushed fully with each operation of the handle. Possibly others, if observing, could/would contact me to let me know the toilet needed another flush. The only drawback would be that observers might get frequent views of my posterior which does not pose a dilemma of any kind to me. One has to be open minded about new technology. That depends if one wants to buy-in to the hysteria. 5G is a communications protocol, nothing more. But of course, the "Faraday cage" folks will scream that it's an evil, globalist plot.